The near side (left) and far side (right) of the Moon, showing the outline of the three biggest impact basins. CREDIT: Japan’s National Institute of Advanced Industrial Science and Technology. The largest dark spot on the Moon, known as the Ocean of Storms, is more than 1,800 miles wide and may be a scar from a giant cosmic impact, researchers say. The near side of the Moon is quite different from the far side. Widespread plains of volcanic rock called “maria” (Latin for seas) cover nearly a third of the near side, but the far side has only a few maria. 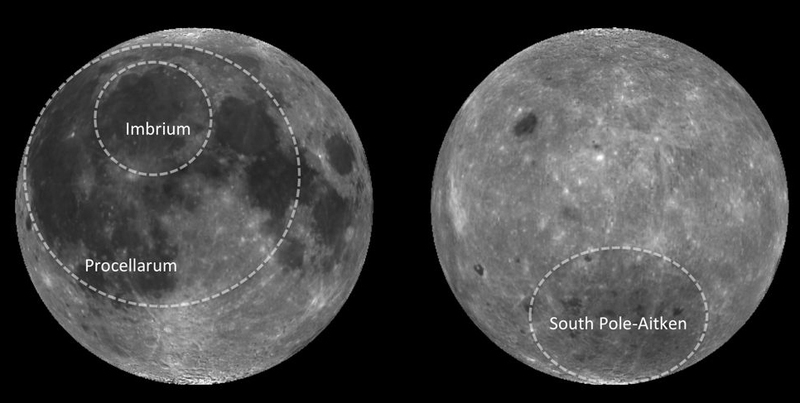 Researchers have posed a number of explanations for the vast disparity between the Moon’s near and far sides, but now scientists in Japan say that a giant collision may explain the Moon’s two-faced nature. The points show high low-calcium pyroxene concentrations, discovered through data mining of Kaguya’s spectral data archive. CREDIT: Japan’s National Institute of Advanced Industrial Science and Technology. The researchers analyzed the composition of the Moon’s surface using data from the Japanese lunar orbiter Kaguya/Selene. These data revealed that a low-calcium variety of the mineral pyroxene is concentrated around Oceanus Procellarum and large impact craters such as the South Pole-Aitken and Imbrium basins. This type of pyroxene is linked with the melting and excavation of material from the lunar mantle, and suggests the Ocean of Storms is a leftover from a cataclysmic impact. This collision would have generated “a 3,000-kilometer (1,800-mile) wide magma sea several hundred kilometers in depth,” said lead study author Ryosuke Nakamura, a planetary scientist at the National Institute of Advanced Industrial Science and Technology in Tsukuba, Japan. The investigators say that collisions large enough to create Oceanus Procellarum and the Moon’s other giant impact basins would have completely stripped the original crust on the near side of the Moon. The crust that later formed there from the molten rock left after these impacts would differ dramatically from that on the far side, explaining why these halves are so distinct. 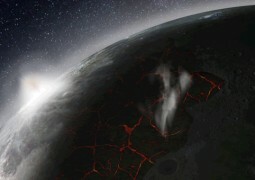 The discovery provides the first compositional evidence that the Procellarum basin was the relic of a gigantic impact, which could be confirmed by future lunar sample return missions, such as Moonrise, a proposed NASA mission that would send an unmanned probe to collect lunar dirt and return it to Earth. The scientists detailed their findings online Oct. 28 in the journal Nature Geoscience.